Even though I grew up eating no onion no garlic food mostly, I developed a taste for garlic. Thanks to my dad. :-) Both I and my dad love garlic. My mom and my grandma don’t prefer garlic much, but given the health benefits of garlic, we do use it, but the usage is limited. I love raw garlic and shallots. We love raw garlic and shallots especially with kambu koozh and yogurt rice. During my postpartum, I consumed a lot of garlic too. Ok, the main reason I am insisting on raw garlic is that this pickle uses raw garlic. Squeeze about ¼ cup of lemon juice from1 big lemon or 2 medium sized lemons. 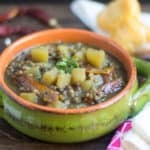 If you don’t have mustard seed powder, you coarsely dry grind 2 tsps of mustard seeds and set aside 1 tsp for this recipe. Peel the garlic skin and set aside. In a wide glass bowl or heat-resistant bowl, add the lemon juice. To that, add the red chili powder, mustard powder, methi powder and salt. Mix them well and make sure there aren’t any lumps. Now add the cashew and garlic and mix them well and ensure the garlic and cashews are coated with the pickle mix. In a separate tempering bowl, heat the oil. 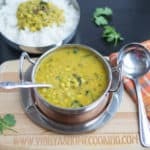 Once the oil is hot, add the mustard seeds, urad dal, channa dal, broken red chilly and curry leaves. 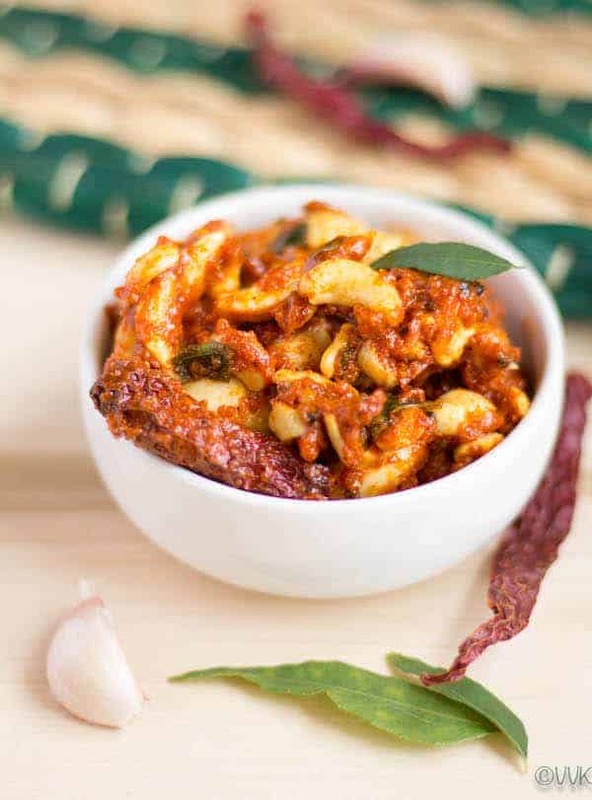 As they start to splutter, add this tadka to the pickle and mix well. That’s it. 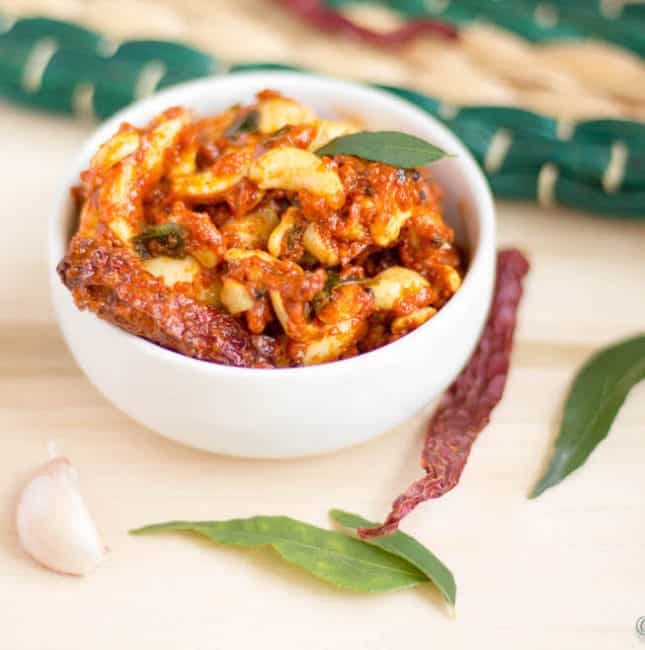 Spicy garlic cashew pickle is ready. Serve hot with rice. Saute garlic in about 1 tsp of oil until it is golden brown. Add these to the pickle mix. Adjust salt and spice as per the sourness of the lemon juice and also as per your preference. I did not add any asafetida here. But about ½ tsp can be added. Whole cashews can be used. As I had cashew pieces in my pantry, I went ahead with that. Instead of lemon juice, tamarind juice can be used too. 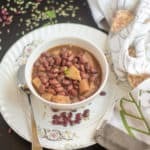 But I haven’t tried this recipe with tamarind juice. 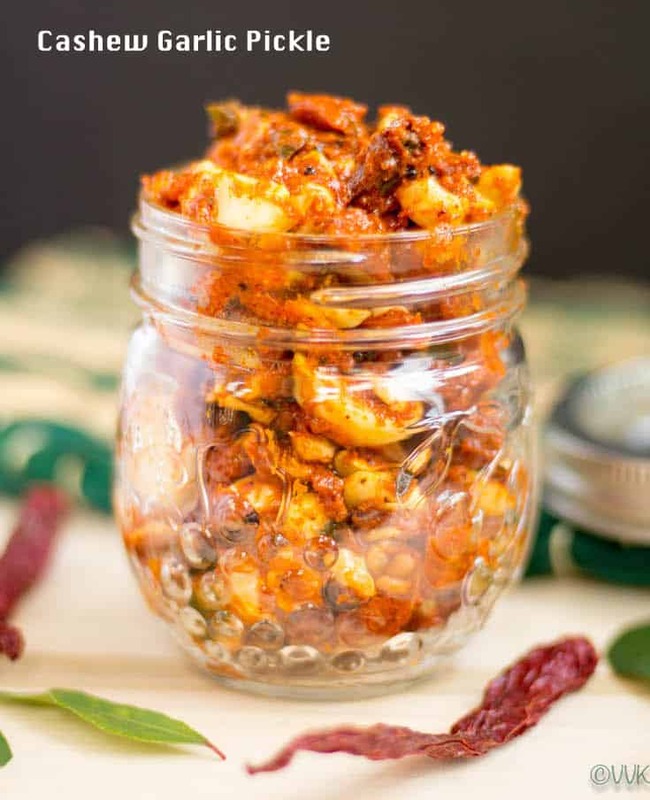 An instant spicy and tangy pickle prepared with raw garlic and cashews. 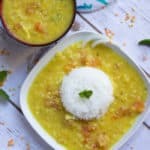 This is a popular recipe from Andhra and Telengana. Once the oil is hot, add the mustard seeds, urad dal, channa dal, broken red chilly ad curry leaves. If you don’t prefer raw garlic cashew, Dry roast cashew without any oil until golden brown Saute garlic in about 1 tsp of oil until it is golden brown. Add these to the pickle mix. I did not add any asafetida here. But about ½ tsp can be added. Whole cashews can be used. As I had cashew pieces in my pantry, I went ahead with that. 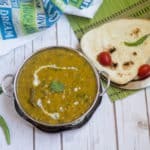 I’m confused about the amounts of Urad dal and Chana dal–how can you use 1/2 tsp? Unless they are ground up? Help! Thanks a lot Sharvari.. How are you doing? Long time. 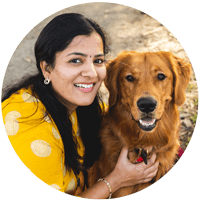 Got to know this recipe via my Telugu friends only. I really liked the addition of cashews. Please do try :-) Thanks. mouth watering pickle!! 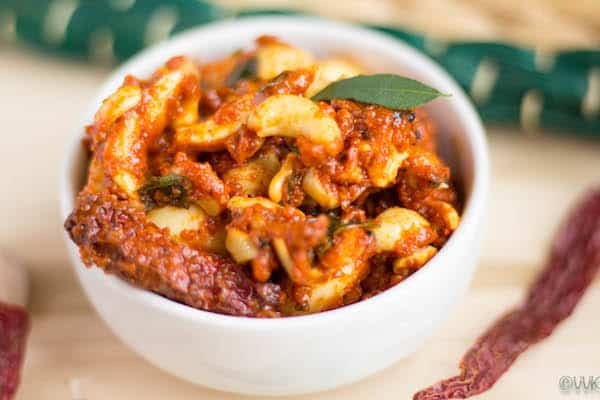 Never had pickle with cashew but your recipe looks awesome! A very new pickle for sure. My husband would love this for sure. Thanks Harini. Please do try them.